Is this unit going to be unlockable only through fragments? Pyrocy779 wrote: Is this unit going to be unlockable only through fragments? I wonder how well they do against jets. They do splash damage and have a 120% multiplier. Boog wrote: I wonder how well they do against jets. They do splash damage and have a 120% multiplier. 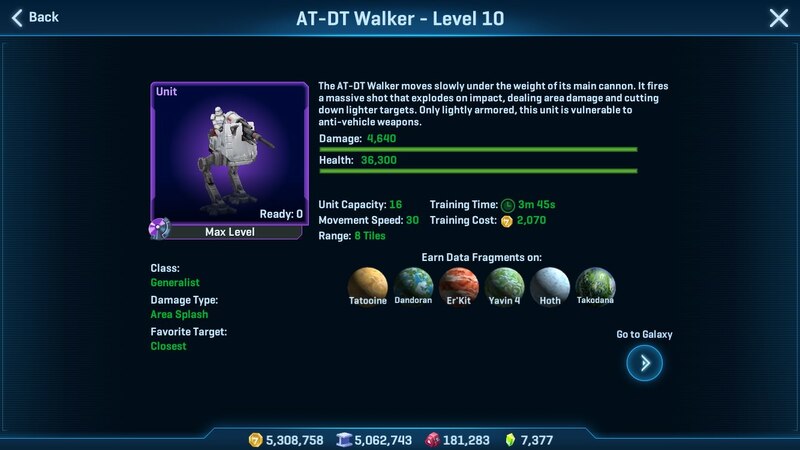 Boog - The AT-DT Walker / Stolen AT-DT Walker has 120% Damage Modifier against Jets / Jumps (and other Units) and has Calculated Damage per Second that ranges from 1800 (Level 1) to 4641 (Level 10). They will be fairly good against "clustered" Unit Groups but with the 3 shots per "cycle" they have a Calculated Damage per Cycle that ranges from 5400 (Level 1) to 13923 (Level 10). With the 1.5 seconds between shots, and 16 UC, it remains to be seen just how they are used and if they are effective. See more info shown at the links above. Yes, it's amazing how they introduced a new unit that seems to be pretty well balanced. I look forward to grinding for it. I expect it to absolutely murder everything in SW. Interesting that they gave it a multiplier against jets. I guess another weak attempt at fixing their broken mess. It's like a garderner adding extra plants to your garden hoping they will crowd out the weeds, instead of you know actually removing the weeds. Looking at it's page it's not just jets though. It's every infantry and hero unit. 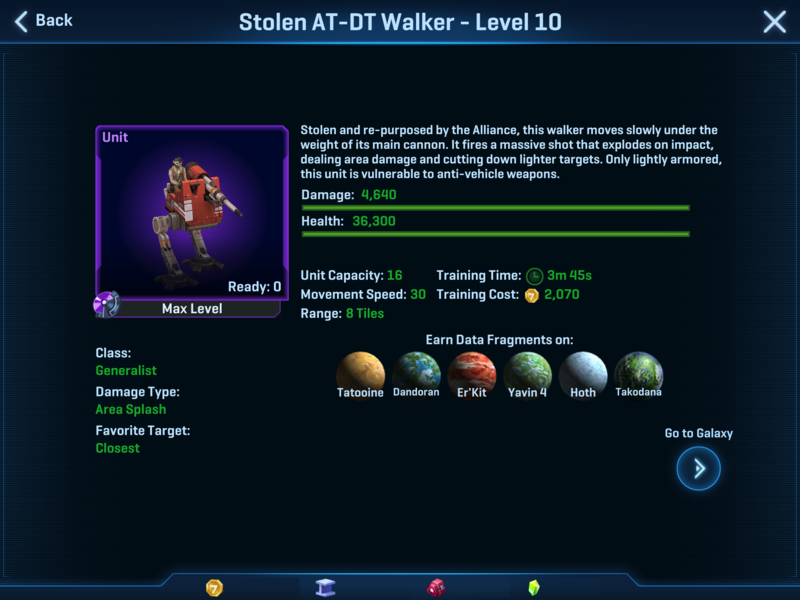 What's the armor class on this thing, will vanguards seek it out or ignore it like they do with ATATs? I got my samples for my Imperial and Rebel bases, but I won't use it only to see how it works... If someone already did, please share a video. Yes would like some feed back on actual use on both factions and see how they fair. I tested the AT-DT on a reb base and it did quite well. It did destroy 3 turrets and cleared some building but it died with a single fang trap shot. Last edited by Harshit on Thu May 03, 2018 4:47 am, edited 1 time in total.